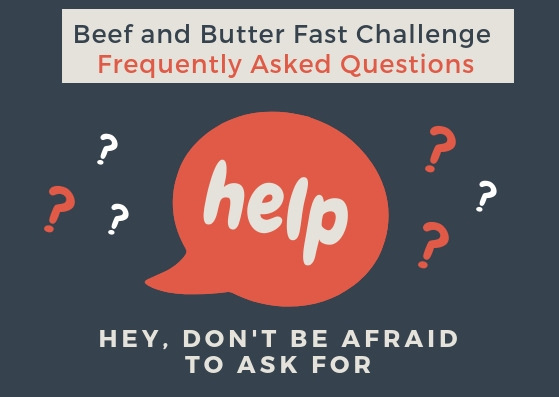 Welcome to the frequently asked questions part of the Beef and Butter Fast challenge! If you have a question that has not been answered here. 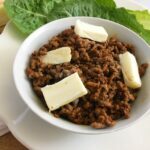 We welcome you to post a question in the Beef and Butter Fast Challenge Facebook group so we can help you. I want to give a huge shout out to Becky G, who is a moderator in our group because she spent a ton of time going back and writing up everyone’s questions so that we could have this one-page resource! Thanks, Becky! You are amazing!! Q. Do I need to prep ahead for the challenge? Q. What all can we eat besides beef and butter? Q. How long is the beef and butter challenge? Q. How can I prepare my protein? Q. 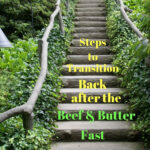 What and how do we eat after we are done the Beef and Butter Challenge is over? Q. How often do I need to weigh myself? Q. How often can we eat like this? A. Most people can eat like this 3-4 days each week and follow a less strict keto way of eating the rest of the week. Please consult a medical professional if you have any concerns. Q. How important is it to eat grass-fed butter? A. Grass-fed butter does have more health benefits than non-grass fed beef. For this challenge, you may use whatever you are comfortable with and that is within your budget. Q. How much beef and butter do we eat each day? A. It all depends on your macro calculations. A typical meal looks like this: 1 cup of cooked hamburger per meal or more for me. Add in up to 3 Tbs of butter per meal. Note: You may want to start out with less healthy fats if it causes you some G.I upset or if you are not fat adapted or have no gallbladder or suffer from Gerds. If you are not used to eating a high amount of fat, you may want to start off at one or two teaspoons instead. Q. 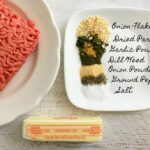 What kind of seasoning could I use to jazz up my beef? A. Seasonings do contain carbohydrates. A. You can use any seasoning you like as long as it doesn’t contain sugar, flour or starch. Read the labels to make sure it’s keto friendly. Q. Is the beef measured raw or cooked? Q. Do I need to drain the fat off my beef once it is cooked? A. This will be a personal preference. If you drain the fats, you will need to add more healthy fats to make sure you are consuming a good amount of healthy fats. I personal drain a little and add butter. Q. Do I still need to eat if I am not hungry? A. Heartburn – try smaller meals and or eat more often. Drain off extra fat, take a digestive enzyme, swig some pickle juice or drink. 1Tbs of apple cider vinegar or 1tbs baking soda in warm water. Diarrhea – cut back on the amount of greasy fat, take a digestive enzyme, eat some fermented foods. Constipated – can’t go? Drink more water with electrolytes, drink warm plain teas, have avocado. Add magnesium to your diet. Magnesium will help support bowel movements. Talk a walk! Q. Feeling light headed what can I do? A. Up your electrolytes intake. Pink Himalayan salt with lemon is great in your water! Make sure you drink a good amount of water. Keto is a flushing diet which means you are losing water. You NEED salt to be able to hold that water in and stay hydrated! Swig some pickle juice. Bone broth is loaded with nutrients that support hydration! Be careful to watch the labels on bone broth. You will be shocked to learn there’s hidden sugar in a lot of popular brands when you look at the labels. I am a big fan of Kettle & Broth because they don’t add sugar! You can use Promo Code: lowcarbinspirations to get a discount on your Kettle & Fire Bone Broth purchase! 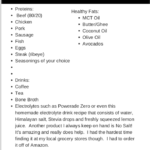 Here is a Homemade Electrolyte drink recipe that is extremely helpful. Be sure to add NoSalt to this recipe for potassium too. A. Up your electrolytes intake. Pink Himalayan salt with lemon is great in your water! Make sure you drink a good amount of water. Keto is a flushing diet which means you are losing water. You NEED salt to be able to hold that water in and stay hydrated! Swig some pickle juice. Bone broth is loaded with nutrients that support hydration! Q. I’m struggling on day 3 (or 2) what can I do? Prepare the proteins differently. (Eg. add broth to the ground beef. How about a steak or some seafood? Deviled eggs? Q. I am not losing any weight?? A.what else are you eating besides protein and healthy fat? Food like dairy and sweeteners can cause weight loss stalls and bloat. Are you working out too hard? Are you stressed? Are you getting enough quality sleep? Maybe a new medication? Q. 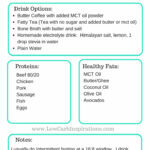 Do I need to have BPC (bulletproof coffee) or Fatty tea? Can I have more than 1 a day? How do I make them? Q. Can we combine the egg fast with the beef and butter challenge? Q. Can we add egg(s) to our Bulletproof coffee? Q. Can I take my collagen during the fast? A. Yes as long as they don’t have any fillers or sweeteners. Just add to your macros if you track them. Q. Do I need to work out during the challenge? A. Nope, not at all. If you do work out you may continue on. Some people find if they work out on this and are not used to that activity they do not lose any weight. Q. I started to going to the gym/working out and have gained weight? A. Sometimes working out especially hard can cause you to gain fluid while your body adjusts to the increase in muscle. Or it is just too much stress right now on your body. Change up your routine slowly and add exercise in after you have the diet part on track. Q. I have never fasted before can I still do this challenge? A. Yes, you may it may be easier to do once you are fat adapted or used to intermittent fasting. Q.How do I know id my beef is 80/20? A. It will say on the package. Q. 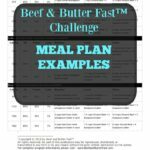 Is it okay to intermittent fast(I.F)during the beef and butter challenge? A. Absolutely! A lot of people do 18/6 (fast 18 hours and eat 6 hours)or only do one meal a day (OMAD). People often find higher results but its not necessary if you are not wanting to do it. Q. What can I eat if I am stuck away from home? Q. 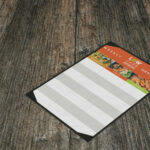 When using the substitution list how much should we eat? A. Use a keto calculator to see what the macro count is for each substitution. That will tell you exactly how much you can eat. Q. Are any sweeteners allowed on the challenge? Or any dairy? A. The purpose of the challenge is to find out what may be stalling us and to reduce inflammation. Both sweeteners and dairy are known to stall weight loss and to cause inflammation and bloating. So try really hard to go without it so you can see if it’s affecting you and your weight loss. Q. Can I have heavy whipping cream (HWC) in my coffee? A. No. It’s not recommended during this fast. The purpose of the challenge is to find out what may be stalling us and to reduce inflammation. Both sweeteners and dairy are known to stall weight loss and to cause inflammation and bloating. So try really hard to go without it so you can see if it’s affecting you and your weight loss. Q. What about carbonated water? A. Yes, you may but it can cause bloating and inflammation> Make sure it does not contain sugar. Q. I fell off the wagon now what? A. It’s okay. Don’t beat yourself up about it. You know what works and you know what you need to do to meet your goals. Come back and do the challenge when you make up your mind to succeed! Q. How do I track my macros? What trackers are best? A. MyFitnessPal offers a free plan. There are better trackers but you might have to purchase one. They are coming out with new and improved ones every day. Q. Any snacks we can have between lunch and supper? A. Yes, mustard is an excellent choice. Q. Is hot sauce okay? A. You bet! As long as it is sugar-free. Q. Can I have my protein shake? A. I don’t use any protein shakes during the challenge because they tend to have ingredients that cause me to stall. I would suggest eating real food so you can determine if they stall you too. A. No, we don’t recommend vegetables during the fast. Vegetables, although healthy, do have carbs. This is a very strict low carb fast. Q. Do I need to be in ketosis first? A. No, you don’t but it is suggested. Q. Does added fat sustain you? Q. Would too much protein stall you? A. Yes, too much protein without the right amount of fat can turn to sugar. This fast is for those in ketosis and not burning sugar. Q. Leg cramps what do I do? A. Up your water intake and make sure each water has added electrolytes (pink Himalayan salt) drink more bone broth with added pink Himalayan salt add magnesium supplement and eat more avocados (they have high potassium). Muscle twitching and leg cramps are a sign of low magnesium levels. Q. Can I chew sugar-free gum? A.No. It is not recommended. Q. My cholesterol is high now what? Q. What can be added to water? A. Best is Lemon or Lime or essential oils or apple cider vinegar. Add salt too! It helps keep you hydrated! Q. Will my cholesterol go up during this fast? A. When you change your diet like this the cholesterol numbers will go up but they are not the enemy here. There’s been good research that shows this is not a problem. I am not a Dr but I will say, do your research. I’m not worried about it.